I am sitting at the Amtrak station when I know I am only one of Sable’s sleek black whisker’s width away from fully committing myself to November’s national novel-writing month. My stomach clenches at the thought. It terrifies me. 50,000 words in 30 days means 1,666.66666 words per day and 6.66666667 pages (of 250 words per page). My quick work on the calculator hooks me in even more. No Satanic inklings here, only the magic of these sequences of sixes, of forward progress–and how, hmm? If I write 7 pages per day, I’ll have written 210 pages by the end of the month. And maybe I’ll throw my hat in the ring for that young adult novel contest, after all. Last week I entered a different book contest, and, counting this young adult contest, I plan now to enter three more this week. I keep the pen moving across the page and remember to pull in air. I can still feel the tightness in my belly, more thrill than fear now, though the balance is close. I feel it in my bones, in the sun on my back, in my pleasure in the conversation I am overhearing part in English and part in Spanish, the fluid back and forth, the “I love you” when they part, father and daughter, I think. I feel in my fear and my thrill I may be truly ready to have my work win one or more of these book contests. If I submit the different pieces I have in mind I could win three of the four contests. I want to laugh out loud, but I keep writing. I am ready to burst out into the literary world with these winnings and the published books. I am ready to take the world by storm or in a swirling rush of wings, the sudden whoosh of the slow, deep strokes of a raven overhead, the feathery brush of angels, my breath easy now in my chest, heart light with hope, mouth full of magic. Here is the little Associated Press newsclip that got picked up in newspapers and posted on their websites. I also have a couple of pieces started about how it has all felt, but they still need to sit for a while. I have not yet fully digested the experience. But I didn’t want to wait any longer to tell you, my dear readers. I will say when I see the 857 entries it makes me gulp. And when I read about the community college professor who won the contest, I get a little thrill. It’s me, I think. It’s me. I make a point of entering my work in writing contests. I’ve been doing it for about four years now. One of my pieces won a small local contest, and most of them have now been finalists here and there. Each time, it heartens me, makes me hopeful. At first I entered almost every contest I came across. Over the years I have narrowed things down some. I tend to not enter the very expensive ones, for instance. And I try to re-enter the ones where people have liked my work in the past. Some contests seem more far fetched than others, but for some reason they appeal to me, so I keep entering them. Fish is one I’d put in that category. I think maybe once a good bit of time ago one of my pieces made it to their longlist, but I don’t remember the details. I don’t remember feeling encouraged by that. (I think it was a very long longlist.) The other day when I was looking over something contest-related, I wondered if I should stop submitting to them. After searching through their lists for my name so many times and not finding it, I was discouraged. And they always had a gazillion entries. I think without admitting it to myself I was wondering if the competition was too stiff, if maybe my work wasn’t good enough. Yesterday when I got their email announcing the winners of their 2014/15 Fish Short Story Prize, I started scrolling through their shortlist with zero expectations of finding my name. (They present the lists in alphabetical order by the writers’ first names.) But I got to the Rs, and there I was–not only listed, but listed twice. 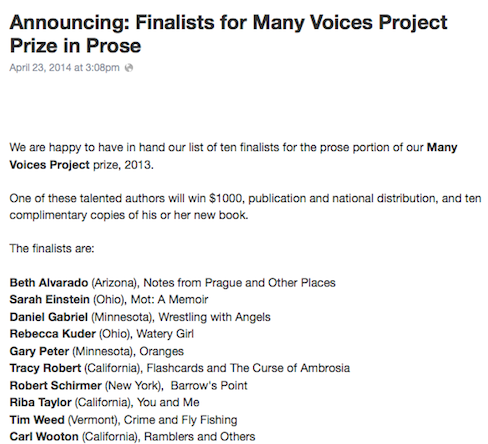 Both of the short stories I entered made the shortlist. Out of 1575 submissions, my two pieces were among 103 that were shortlisted. I can’t believe they both made it there. It still makes me grin, remembering what a sweet surprise it was to see my name and the two titles. I just wanted to let you know, my faithful readers. I am feeling encouraged now. And grateful, too. If Fish has shortlisted them, then who knows what might happen next.